Since I started keeping a 'butterfly year' record on the internet I have failed dismally to maintain it for the whole year, mainly because I am away on holiday without a computer when I see most butterflies. This year I shall try to do better. Click HERE for last year's beginning (I only got as far as 1st June), HERE for 2001 and HERE for 2000. Saw no butterflies in January this year. 24th - After more than a week of sun and Bise (the cold wind) we now have sun and Föhn (the warm wind). Today a small tortoiseshell was flying over the ski piste at Les Rasses. 25th - The Föhn blew overnight and was still powerful in the morning, but nevertheless a small tortoiseshell was cruising around my house and garden at 11.00am. Primroses were out below Gryon. 5th - Small tortoiseshell. Despite quite a lot of good weather recently, this is the first day since Feb 27th I have seen a butterfly. 7th - Small tortoiseshell flying below La Barboleuse. 9th - Small tortoiseshell flying in Engadine (Eastern Switzerland), at finish of skimarathon (about midday). 10th - Plenty of small tortoishells about wherever there is sun and a peacock also, at Ollon. Today was very warm and springlike. 11th - Even warmer and springier - plenty of small tortoiseshells about. Saw one white butterfly at very great distance but no possibility of identification. 12th - Small tortoiseshells in plenty and two peacocks, one basking on the table in my porch. Many flowers are now in bloom, including primroses, snowdrops, early dog-violets, wood anemones, stinking hellebore, crocuses and Hepatica. 13th & 14th - Small tortoiseshell. 15th & 16th - bise blowing - bright and sunny but no butterflies. 17th & 18th - bise dying down - warm and sunny - small tortoiseshells. On 18th, walked wooded gorge back from Huémoz to Barboleuse. Plenty of spring flowers out but for butterflies, still only small tortoiseshells (lots). Last year small tortoiseshell and peacock were my only butterflies until 31st March. 19th - 23rd - still warm and sunny but still only small tortoiseshells. Have not even seen peacock so far this week. 24th - Saw small white or green-veined white in flight at about 10.30am, at Barboleuse, but can't count for checklist as I don't know which. Ever warmer and sunnier. Many small tortoiseshells about and two or three commas today, aslo flying around La Barboleuse. 25th - Small tortoiseshells in plenty. A probable peacock at distance. Single small white at Ollon. 28th - Clouds and even rain at times. Small tortoiseshell. 29th - Small tortoiseshell frequent everywhere. Single wood white flying on verge of main road near Bex. Single peacock, Bex. Small white frequent. Single Queen of Spain fritillary near Monthey and single holly blue in Monthey. 30th - Small tortoiseshells, small whites and a male brimstone at Gryon around midday. Comma flying in garden later in day. By evening, rain had moved in. 1st - Very warm. Small tortoiseshell, comma near Gryon. Grizzled skipper in my garden, on coltsfoot flowers. I examined it, then went in to get my camera, but it was gone when I went out again. Later in day, peacock in garden. 2nd-3rd - Snow moved in, covering my garden to depth of 15-20cm. No butterflies. 4th - Warm sun little by litle melted the snow, which completely covered my garden in the morning, but no butterflies flew during most of the day. Then, at 5.15pm, while I was doing some gardening, a grizzled skipper appeared and I photographed it (see pictures HERE). Half my garden still has snow on it! 5th-7th - often sunny but cold, especially on 7th when bise blowing. Small tortoiseshell the only butterfly seen, and none on 7th. 8th - very cold. Just just a few small tortoiseshells zooming around in couples in the garden. 9th - 12th - Very cold, often snowy. No butterflies. 13th - Warm sun in the afternoon, together with warm air, almost completely melted the snow. Several small tortoiseshells flew through the garden and one peacock. The first painted lady I have seen this year flew by at about 3.00pm and a small white flew late in the day. 14th - Peacock, small tortoiseshell and small white. 15th - Travel to UK. Small whites visible from train on outskirts of London. Small white and small tortoiseshell on arrival in Suffolk. 16th - Warm and sunny. Small tortoiseshell, peacock. 17th - Very warm and sunny. Orange tips in garden; small tortoiseshells, peacocks, speckled woods and a comma at Rendelsham. No dragonflies or damselflies there, surprisingly. 18th - Warm sun turning to quite a chilly wind. Peacock and small tortoiseshell. 19th - Generally cool, with some rain. 20th - Easter day. Surprisingly warm in morning, with orange tip, speckled wood and comma in garden. Holly blue female laying eggs on holly around midday. 21st - Warm but quite windy and sometimes cloudy. A trip to Bromeswell and Sutton Hoo produced no green hairstreaks (probably still just too early) but plenty of green-veined whites (after first of year for me flew in garden early in morning), small whites, orange tips (also common in garden), peacocks, small tortoiseshells and some very well-marked speckled woods. Male brimstone roding in garden at lunchtime. In the afternoon a trip to Butley and Staverton turned up a single small copper, as well as plenty of peacocks, small tortoiseshells, a comma, small and green-veined whites, speckled woods and a female brimstone. Winchat singing from telegraph wires. 22nd - Walk near Sutton Hoo in morning. No green hairstreaks but nightingale singing, as well as chiff-chaff, willow warbler and whitethroat. In afternoon, first swallows flying at East Lane, and stonechats about. No new butterflies today, but plenty of peacocks especially, as well as small tortoiseshells and assorted whites. 23rd - Usual butterflies in garden, including holly blue, speckled wood and plenty of orange tips. No green hairstreaks! Trip to Minsmere in afternoon. Very many peacocks, some whites, speckled woods and orange tips but still no green hairstreaks. Ruff coming into their frilly costumes but not there yet so just looked scruffy. Good view of bittern flying over marshes. 24th - Flew back to Switzerland. Saw a few whites and a painted lady on return. 25th - First chequered skipper of the year, in my garden, as well as first pale clouded yellows. Near Bex saw violet fritillary. Also small tortoiseshell, orange tips, small whites. 27th - Dingy skipper in garden. Also wood white, large tortoiseshell at Gryon. 28th - Small tortoiseshells. Green hairstreaks above Barboleuse. Pale clouded yellows. Common blue in garden. Orange tips. Small white. Little blue in Bex in afternoon. 1st - Plenty of little blues in garden. Orange tips. 2nd - Female pale clouded yellow laying eggs. 3rd - Painted ladies becoming frequent. A pair in garden sitting next to each other, head to tail, then much later flying and flirting. Green hairstreaks in garden, as well as little blues, common blues, dingy and grizzled skippers, wood whites, green-veined whites, orange tips and some small heaths. 4th - 28 species seen incourse of today, 26 of them on South-facing slopes near Martigny. At first site here, wall brown abundant, including some very large females which recalled large wall - but were not. Chequered blue also abundant! 60+ individuals seen during relatively short walk. Some very large, all instantly recognisable in flight. None very blue - always with a leaden appearance. Characteristically uneconomical flight, never going far, often settling in same places. Small tortoiseshells still around. Little blues common but not abundant, including at least one that looked very large - video to be analysed. Swallowtail occasional - some very large, bright individuals. One scarce swallowtail, looking very yellow. Orange tip. Glanville fritillary superabundant. Near where I live there are none - the common Melicta/Melitaea fritillaries are meadow and heath. Today I saw hundreds of Glanvilles and almost nothing else. Green-veined white. Pale clouded yellow. Adonis blues fairly common, but nearly all males (one female). Grizzled skipper (just one or two). Red admiral. Common blue. A very large skipper was widely present, which I think was safflower skipper. I have distance shots from video which seem to confirm this - and this is the only large Pyrgus that should be on the wing at this time (according to some of the books!). It often looked particularly well marked and appeared huge in flight. A single clouded apollo flew past, showing signs of having been on the wing for some time! Small white. Wood white. Mountain dappled white. A smallish congregaion, apparently on a single patch of yellow mustard flowers. Apollo - 6-10 individuals, with 5 being visible simultaneously for a while. These flying on rough slopes near to cultivated land. Small heath. Chapman's blue. Dingy skipper. Green hairstreak. Green underside blue - my jinx butterfly! I thought I had never seen one before. I now think I might have passed over it a few years ago when I thought I had some very early mazarine blues - the blue was deeper than I had expected. There was no doubt about the identity of these insects today, but I got lousy pictures and will have to go back again. They were flying on the grassy bank at the side of a road, together with adonis blues and Chapman's blues. Duke of Burgundy 'fritillary' - just one seen today. The first of the year for me. Back at Bex after this walk, saw one male and one female large white and a single small pearl-bordered fritillary in rough land not far from the station. 5th - Hot again, especially in afternoon. Garden alive with small butterflies: common blue, Chapman's blue, little blue, grizzled and dingy skippers, green hairstreaks, orange tips, whites. Painted ladies flying through. New for year also now woodland ringlet and sooty copper. Swallowtails occasionally dropping in. 6th - Mazarine blue in garden. 7th-8th - Garden continuing to heave with butterflies, including grizzled and dingy skippers but not chequered. Swallowtails passing through. A comma on 8th. Adonis blues flying on ski slope. 9th - Northern wall near house. A very small male specimen - very dark. 11th - Trip to near Martigny. Butterflies seen: Wall brown (abundant - no large wall brown, though some of the females especially were huge); Queen of Spain fritillary (a few); Glanville fritillary (abundant, buzzing and gliding everywhere); Chequered blue (abundant); small tortoiseshell (a few); Southern small white (a few - my first sightings of this butterfly in Switzerland); probable male mountain green-veined white, but I never confirm males! ; safflower skipper (abundant - many of them stopped and let me photograph them, for which see here); common blue (plenty); pale clouded yellow (at least one separated with certainty from Berger's - plenty of the two species flying around); adonis blue (frequent, mostly males but some females); swallowtail (a few); little blue (many); clouded apollo (just one, flying fast over the meadows - good condition); Berger's pale clouded yellow (one female flew slowly and repeatedly right under my nose, enabling me to see its upperside markings and even wing shape beautifully in flight. Needless to say, I could not photograph it); scarce swallowtail (one); orange tip (several); Chapman's blue (I didn't check every blue, but at least some of the 'common blues' were Chapman's, including some females); green underside blue (a beautifully fresh female, that I couldn't get good pictures of because a chequered blue was buzzing it! ); wood white (not up on the slopes, surprisingly, but down by the river); small heath (just a few). Saw my first meadow fritillary of the year on return to Barboleuse in afternoon. 12th - Mixed day of cloud, some rain and also a fair amount of sun. A geranium argus was checking out the cranesbills near my vegetable patch and a large wall paid a visit to the rockery. A chequered skipper was also hovering in the vicinity of the garden. Otherwise, the usual butterflies were on the wing, including small tortoiseshell, which I have seen without interruption since the first hibernated specimens woke up. 13th - cold, turning to rain. 14th - snow! 15th - Adonis blue, woodland ringlet and small tortoiseshell all near house. Also common blue, pale clouded/Berger's clouded yellows. 16th - Little blues now very common near my house and in region. The first false heath fritillary of the year near Gryon. Small white, common blue, orange tip. Sunny, but not really warm again yet. 17th-30th - mixed weather, sometimes rainy, sometimes even snow, often misty and occasional sun. In general, slow change in butterfly mix. Remarks for this period: Woodland ringlet increasingly common in most meadows near woodland; small tortoiseshell still abundant, especially high up; common and Chapman's blues abundant, though common commoner - Chapman's more local; silver-studded blue very much in evidence, with a very thriving colony under the cable car lines from Barboleuse; small white and green-veined whites common throughout; small heath increasingly common; pale-clouded yellow/Berger's clouded yellow common throughout, but clouded yellow not so; painted ladies becoming really abundant by 30th - this is a cardui year; ; wood whites throughout period; orange tips; speckled woods commoner daily, though only in shady regions; dingy skippers and grizzled skippers throughout period, though appearance of red-underwing skipper means flight ID of grizzled skippers less reliable now; little blues abundant; commas occasional in first week, none in second; mazarine blue increasingly prominent in meadowland; gernaium argus increasingly abundant, as also the wood cranesbills (Geranium sylvaticum) that they feed on; wall still locally common; northern wall frequent, especially high up; large wall increasing; chequered blue last seen (abundantly) on Sunday 25th May - site not visited since; same for safflower skipper; adonis blue very common this year; glanville fritillary still common on 25th May but less than previously (day quite windy); first high brown fritillary on Sunday 25th May; southern small white still flying at the only site I know on 25th; brimstone, 25th; green hairstreak throughout period, but far tattier at low altitudes towards end; scarce swallowtail regular in Martigny region - none in my region; Queen of Spain fritillary throughout period; large white not common, but seen on 28th May in garden; first red-underwing skipper (in garden) 30th May; sooty copper increasingly common throughout period; brown argus on 30th May; pearl-bordered fritillary in Arveyes, 30th May. 31st - First trip high up, to Bretaye and the Grand Chamossaire. Found generally little about, but plenty of marsh fritillaries (first of year) and several largish Pyrgus, none of which let me see it well enough for identification. They looked very similar to the safflower skippers I have been seeing near Martigny. Plenty of green hairstreaks around bushes, a single clouded apollo and a lovely colony of pearl-bordered fritillaries below the Petit Chamossaire, on the edge of the woods. Two or three northern wall browns. Grizzled skipper by Lac Noir. Possible bryoniae, but it didn't stop for identification. Common blue. Speckled woods just above Chesières. 1st - Watched dozens of silver-studded blues flying together underneath telecabine wires - a really thriving colony. There have been Chapman's blues there recently, but today only silver studs in evidence. Single, tatty Duke of Burgundy at a good site near Chesières, suggesting their days are now numbered. Dark green fritillaries in fine fettle at same site - my first of the year. Pearl-bordered fritillaries at woods below Panex, as well as a single, very tatty, Queen of Spain and several dark green fritillaries. Plenty of speckled woods. Adonis blues common. Meadow fritillary, but otherwise no Mellicta/Melitaea. Red underwing skippers and sooty coppers increasingly in evidence. First meadow brown of the year. 2nd - Large skipper in garden. 3rd to 6th - Same species in evidence as recently around my garden. Increase in large skippers and woodland ringlets, as well as red-underwing skippers. 7th - trip to Simplon Pass. Common blue (frequent); apollo (abundant at some sites); small tortoiseshell (common, though often tatty); painted lady (common); adonis blue (common), large blue (one, female); zephyr blue (my first ever - abundant at one site, though absolutely restricted to its foodplant, stemless milk vetch. Males often attracted other males and flapped their wings at each other, as well as their abdomens sometimes. One mating couple was surrounded by three other males. All subspecies trappi); little blue (common); pale clouded/Berger's clouded yellow (common); wood white (common); heath fritillary (common - as ever, quite hard to be certain none were some other species of Mellicta); probably meadow fritillary (a well-marked female, which might have been heath fritillary); small heath (common, but not abundant); Darwin's heath (present at a couple of sites. My first ever); speckled wood (one); chalk-hill blue (one - this is very early for this species, which is more typical in July); wall (a few); large wall (common); northern wall (two individuals); pearl-bordered fritillary (several individuals, generally near woods); small white (several); mountain dappled white (one striking variant, with greatly reduced markings on the underside); mountain green-veined white (common at some sites high up); Alpine grizzled skipper (present at low density at some sites); dingy skipper (common); green hairstreak (a few, high up on bilberry - mostly quite tatty); grizzled skipper (a few); marsh fritillary (several, right up at the Pass itself); red-underwing skipper (a few); Escher's blue (a single, at least); idas blue (quite common at one site); black-veined white (a single individual, in flight); false heath fritillary (several); almond-eyed ringlet (several at one site - but I was not able to get any photographs. My first ever). 8th - Several red admirals around. Tufted marbled skipper in my garden in afternoon. Large whites. Ringlet in late afternoon - my first of year. Two red admirals. Storms in evening. 9th - Warm and sunny again. Garden really alive with butterflies, including thriving colony of tufted marbled skippers and now several Titania's fritillaries. Maybe had a lesser marbled fritillary flying through, but I could not swear it was not Titania's too. Lots of dark green fritillaries. Ringlets now common in Gryon and La Barboleuse and woodland ringlets almost simultaneously reduced in numbers. Both these changes were very rapid. Meadow browns common and large skippers rapidly on the increase. Wood whites still around. Patches of wet ground now beginning to attract clouds of blues, including mazarine, common blue and little blue today near Barboleuse. 11th - Very tatty chequered skipper in garden. Chalkhill blue on ski piste. 12th - Heath fritillary near garden. Titania's fritillaries now common. Very tatty sooty copper. Niobe fritillary. Arran brown in woods at end of my garden, just above quarry. Marbled white in garden. 14th - Woodland brown near Panex. Many high brown fritillaries at same site. Ringlets, meadow browns and other summer butterflies now established on the wing. 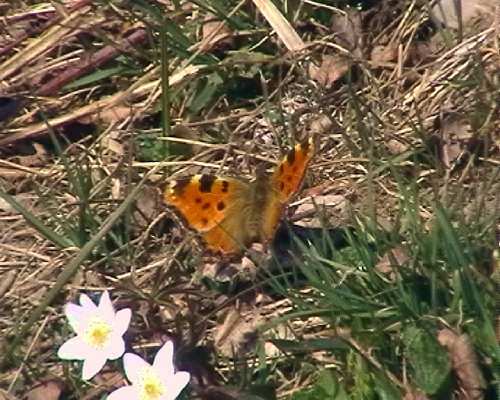 15th - First violet coppers of the year, in marsh land above Villars-sur-Ollon. It took a long time to find sufficiently marshy ground, with bistort, and the colony was very small so for a while I thought there were no coppers there. 16th-19th - Essex skipper came on the wing on 16th (first near Gryon) and small skipper on 19th. First silver-washed fritillary flew on 16th. Garden still heaving with insects, with Arran browns common, a single woodland ringlet on 16th, small, green-veined and large whites, wood whites, large walls still very common. Adonis blues and chalkhill blues flying together, both in good condition, on ski piste. Orange tips still around. Haven't seen a grizzled skipper for a while, but dingy skippers still on wing a little higher. Titania's fritillary now abundant, as dark green/high brown/niobe (I don't always check, as they cruise around). My colony of silver studded blues is still abundant, and they are common in other places too. Red admiral, painted lady and small tortoiseshell all flying. 20th - Woodland brown site now with many butterflies flying - probably saw upwards of 25 individuals today, many of which settled briefly. Silver-washed fritillaries there too, but little else (a few speckled woods). As we left, saw a single large tortoiseshell. Went next to violet copper site, where found at least half a dozen individuals - difficult to tell as they were in a small locality and often returned to same places. Also purple-edged coppers, male and female, a few lesser mountain ringlets, a single (at least) bright-eyed ringlet, loads of Titania's fritillaries and a fair number of lesser marbled fritillaries. Good numbers of geranium argus, also little blues, silver-studded blues and at least one unidentified larger blue, which remains a bit of a mystery (definitely not common blue or Chapman's blue). End of June to 7th July: my detailed records of this period have been lost, as I have lost my dictaphone on which I record everything I see. In general, the new species mentioned on the checklist for this period have come to prominence, some becoming far more common than in previous years. Great banded graylings have been very common. Large ringlets abundant in several places. I shall try to recover some notes from my video. 10th-17th July : I have been in the Val d'Aran for my annual pilgrimage. This was about a week earlier than I usually go but the butterflies were excellent, as expected. Barcelona produced its usual Geranium bronzes, then the Val its wealth of fritillaries and blues. Some of the water crossings were exceptional this year: I counted 30 species during an hour at just one spot. I missed very little of what the Val has to offer and will post all of this on a special page very soon. New species for the Val this year were white-letter hairstreak and woodland grayling. Rarer than usual were Bath white and purple hairstreak, bizarrely, as well as Lang's short-tailed blue, of which I saw none. Much commoner than usual were Niobe fritillaries. I saw both forms of ilia and both forms of niobe and found my first ever female ilia (which was of the 'normal form', not clytie). 22nd-25th - trips around my patch and along the Rhône Valley, with Tim Cowles, whose website you can find here. On 22nd we visited Crans Montana, where we were hunting but failed to find Cynthia's fritillary. Nevertheless, we did find a lot else, including plenty of water ringlets, abundant Swiss brassy ringlets, a single female Alpine argus, lots of eros blues, a few glandon blues, plenty of shepherd's fritillaries (no mountain fritillary), damon blues, chalkhill blues and much more. There was a dead great sooty satyr near Vermala but we saw none alive. On 23rd we visited a site in the Bernese Oberland, where a single, rather tired dusky large blue was still flying. On an often cloudy and even rainy day we saw turquoise blue and quite good numbers of familiar but beautiful butterflies, including Titania's fritillaries. Instead of coming straight home, we took a trip up to the Diableret glacier but it turned out to be either too late or too cold for peak whites, which we were looking for. A very pleasant walk nonetheless, with plenty of Swiss brassy ringlets. 24th July largely rained off. On 25th we went up to the Grand Chamossaire, where common brassy ringlets were flying, as well as mountain fritillary, manto ringlet and lesser mountain ringlet. A single clouded apollo disappeared over a precipitous slope, followed later by an apollo, my first of this last species for the site. While trying to track it down, I saw a wallcreeper - a life tick for me. We finished off this day by going lower down to a dryad site, where dozens of this species were enjoying the sunshine. 26th - trip to Grimsel Pass. Notable species for the day were moorland clouded yellow and eriphyle ringlet, this last being sparsely distributed amongst thousands of Swiss brassy ringlets and lesser mountain ringlets. A brief stop on the way back produced great sooty satyr and spotted fritillary, my first of these two species for Switzerland, apart from the dead one earlier in the week. 1st - trip to Simplon Pass. Generally, one had the impression that the season was growing old, with several species notably absent. But marbled ringlets were common, as well as Swiss brassy ringlets and lesser mountain ringlets. A few water ringlets were also around, some in very good condition. Chalkhill blues were the commonest blues, though there were plenty of idas and at least one silvery argus. In certain places, notably the heathier spots, graylings were flying and a little lower down, in grassy areas, dusky meadow browns were common. Saw a single Camberwell beauty. Several Pyrgus skippers proved totally unidentifiable, even after close examination. Certainly, carline skipper was present and almost certainly large grizzled skipper. Some of the others were baffling and I cannot show pictures because I left the battery and charger of my camera in the Val d'Aran and couldn't borrow a substitute for today... But my species of the day was rock grayling, which I have never seen before. I am confident of the identity because of detailed Swiss maps which rule out woodland grayling in the place we saw the rock graylings. In addition, close examination showed all the classic signs of rock grayling including, in the male, a clear apical spot than woodland, an 'elbow' on the upperside hindwing postdiscal band and generally the small size (though one female did look disconcertingly large).